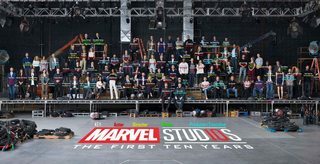 To celebrate the tenth anniversary of Marvel Studios, Marvel released this picture featuring actors, directors, writers, and producers from all the MCU movies. Click the image to view the full size. 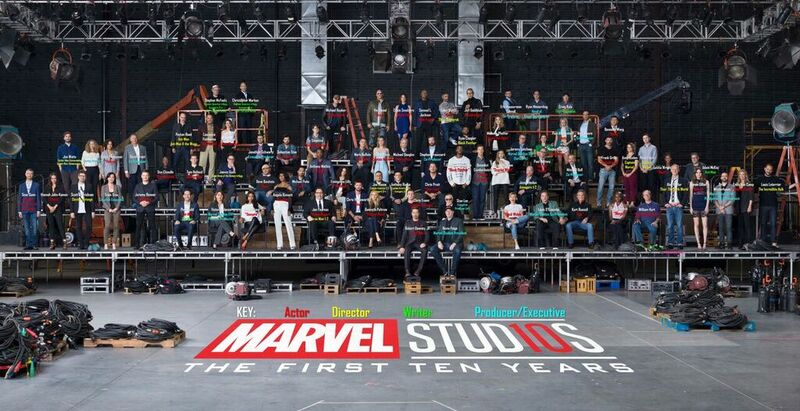 Who are the MCU actors, directors, writers, and producers in this photo? According to ScreenRant's article on the matter, a complete list of the actors was available. Combining this with this reddit thread on the matter provides us with the full list below, with directors and writers and their respective roles, and actors and their main/first role (in comment below the one linked). A visual is of the below list is provided at the bottom. Not the answer you're looking for? Browse other questions tagged marvel marvel-cinematic-universe actor-identification or ask your own question. What are the criteria for receiving an official Marvel universe designation (Movies/TV)? Why aren't MCU movies featuring Coulson after Avengers? What's the in-universe explanation for the change of face of Bruce Banner? Is Hulk classified as a hero or villain by the MCU writers? Who's the child and her mother that can “talk to flowers” in Ruins? Do Samuel Jackson, Natalie Portman, Idris Elba and Benedict Cumberbatch exist in the MCU? What do Ant-Man and Black Panther contribute to the MCU?